The Saskatoon Fire Department says all the train cars involved in Tuesday's derailment have been cleared from Highway 11, just north of the city. Canadian National Railway workers are continuing to repair the section of damaged track along the highway this morning. By Wednesday evening, the Saskatchewan Ministry of Highways had reopened one northbound lane of Highway 11. The southbound lanes had been reopened earlier, on Wednesday morning. By early Wednesday, CN had a fleet of heavy equipment, including semi-trailers, out at the crash site, with flood lights and a chain-link fence set up nearby to create a makeshift construction site. Saskatoon assistant fire chief Wayne Rodger was unsure how many railcars had to be cleared off the track. "All I'm aware of is that there was 30 that left the track. And they were pretty much kind of accordioned side by side all across the roadway," he said. He said he's never responded to a derailment of this magnitude, and he hadn't expected CN to get as far as they had in the first 24 hours after the crash. Railcars are still along the roadside, which will be the next cleanup priority once the highway is open. The makeshift fix to get traffic flowing again included replacing the rail tracks and laying down gravel and rock to secure them down, Rodger said. Investigators with the Transportation Safety Board arrived at the scene on Tuesday night and are in the process of gathering information on the derailment. The train was hauling grain along a CN line near Highway 11 and Wanuskewin Road. The Fire Department received the call around 9:26 a.m. CST and found a locomotive leaking diesel and on fire. The fire department said 30 of the train's 52 cars were derailed. 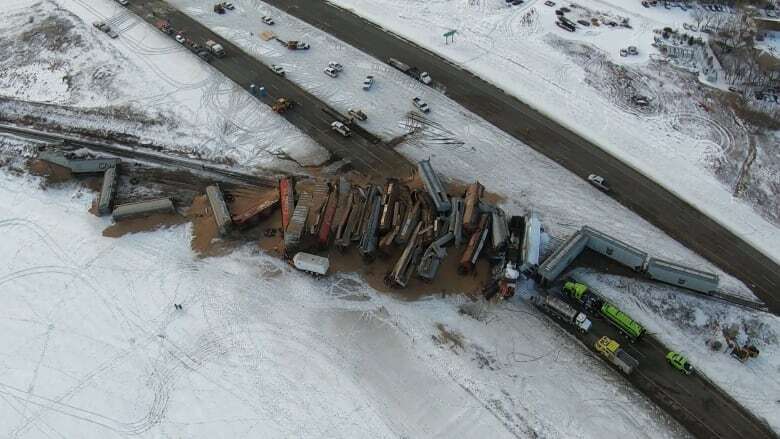 No one was hurt in the derailment and shortly after the crash CN said there was no danger to the public, as no dangerous goods were being hauled. Sheryl Spence, the mayor of nearby Warman, said she was shocked to hear that the train had derailed but relieved when she learned no hazardous materials were spilled and that everyone was safe. "I think we all just need to be patient. We need to be thankful and grateful that there was no injuries and that it's being cleaned up so quickly." Spence said that emergency crews in her city were well prepared for the derailment. Last week, Warman's Emergency Measures Operation team had a workshop on how to handle a train derailment. In addition, Spence said the Warman Fire Rescue had recently completed CN sponsored training in Colorado on how to deal with train derailment. A previous version of this story said all northbound lanes of Highway 11 had been reopened by Wednesday evening. In fact, only one northbound lane was reopened.